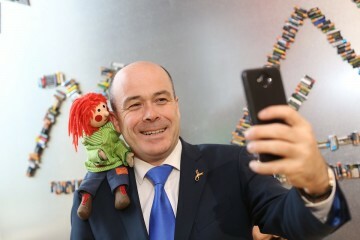 Bosco and Minister for Communications, Climate Action and the Environment, Denis Naughten TD today launched WEEE Ireland’s battery recycling campaign for 2017 at the Rediscovery Centre in Ballymun. 1 in 5 admit to putting waste batteries in the bin, but what a waste! Batteries can be easily recycled in the blue recycling boxes in schools or in any of the thousands of shops that sell batteries across the country – It couldn’t be easier to make battery recycling part of the household routine. Since 2011 Bosco and WEEE Ireland have made it their mission to not only make a difference to the planet, but also to the lives of the boys and girls with life-limiting conditions and their families at LauraLynn. The message has captured the hearts of many around Ireland and powered by peoples’ great battery recycling efforts, Bosco and WEEE Ireland have raised over €285,000 for the charity in that time.